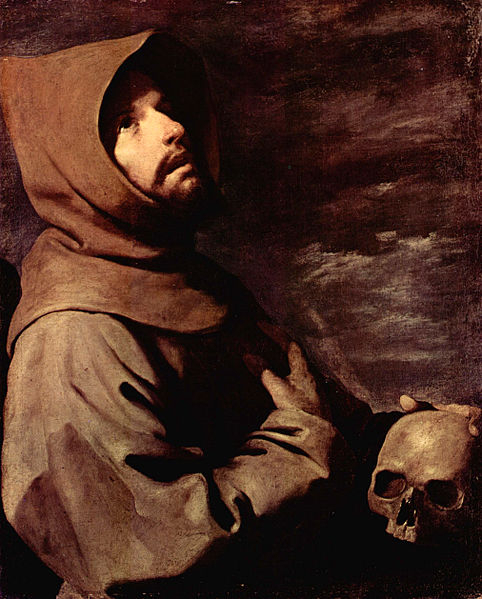 Saint Francis of Assisi was one of Francisco de Zurbaran’s favorite subjects. During Zurbaran’s lifetime, 1598 through 1664, several of the reform branches of the Franciscan order hoped to claim Assisi as one of their own. They would commission painters to depict Assisi wearing their particular habits. Historians believe that this Zurbaran painting of the Saint was done as a commission for a community of Discalced Friars. Discalced is a term used to refer to Friars who go barefoot or only wear sandals as Assisi was known to have done. In this painting, Saint Fracis is portrayed as a penitent ecstatic. Ecstasy, in this case, is that state of consciousness induced by meditation which includes contact with something extremely beautiful or holy – in this case, the skull. Within the Catholic faith, skills are “symbolic of meditation and of detachment from the world.” Some believe a skull would remind us all of our limited time here on earth. During the 17th century, it was somewhat typical of Spanish and Italian painters to include images of skulls in their portrayals of Saints. This painting depicts Assisi, alone with his thoughts. He is outside and there are no buildings in view. One of his hands rests upon the crown of the skull and the other is draped across his chest. He wears what appears to be a somewhat patched cowl and habit. A murky gray sky, with a scant few light clouds, seems to illuminate Assisi’s face and the forehead of the skull. If you look closely, you might notice that this painting has a pentimento. A pentimento occurs when an artist appears to change their mind about the placement or shape of an object while they are working on the painting and some sign of their original design remains. Sometimes a pentimento can only be see through close inspection with X-rays or infra-red reflectograms. In this case, the pentimento somewhat blends into the sky and the observer could easily assume that it is part of a distant sunrise or sunset. Look at the hand laid across Assisi’s chest. The pentimento is just to the right. We can clearly see that Zurbaran had originally placed the hand away from the body rather than resting upon it. It also looks like he had originally included a bit more of the hand that is sitting upon the skull but decided to change that as well. In trying to imagine how the work would look, had the original positions been retained, it would seem that the overall feel of the painting would be a little diminished as the hands would have more prominence than the skull does. Zurbaran is thought to have completed this painting of Saint Francis in 1660. It is an oil on canvas painting which measures 65 by 53 centimeters. To learn more about this famous Spanish artist and see more examples of his work, please visit our Francisco de Zurbaran biography.